Before I really get into this, let me just say this upfront: wait to read this until AFTER you’ve seen the movie. I didn’t want to spoil anything originally but I want to dive into all aspects of this movie, so you’ve been warned. This is (mostly) why I’ve taken awhile to write this up; so most of you have had a chance to see it. JJ Abrams and the crew behind The Force Awakens have taken every possible measure to keep all plot details hidden from the public before seeing it, so there is a ton to discuss. That being said, Episode VII was AWESOME. I’ve seen it twice already now, and let me tell you that the second time is even better than the first. Without the burden of impossible hype and surpassing the stimulus overload that is The Force Awakens, viewing it after getting past all that is even better. Although nothing beats the initial experience of the lights dimming, Lucasfilm logo appearing, and the crowd going wild as the opening scrawl appears. JJ Abrams, Kathleen Kennedy, and the people at Disney have successfully brought Star Wars back to the light. Let me first say that while I loved this movie, it definitely isn’t perfect. There were some issues I had with it, the biggest being that it isn’t terribly original. Force Awakens is basically a partial reboot of A New Hope, with bits of the other two original trilogy films mixed in. There’s another deathstar (the third one now! ), a droid holding onto secret information for the new rebels (now called the resistance) and a familiar desert planet and an ice planet (now called Jakku and Starkiller base, respectively). As well as not being terribly unique, the plot takes an astonishing number of convenient turns to get the characters where they need to go. Finn and Rey need a ship? Oh look, the millennium falcon! As soon as they get into space with it? Han Solo and Chewie! What are the odds!? I’d say a bit more than 3,720 to 1, in this case. As well as that, the movie dishes out a bit too much fan service to me, with Luke’s light saber practice droid and the holo-chess scene, but now I’m just nitpicking. Those are basically my only gripes with Force Awakens, and they didn’t even come close to ruining it for me, which is a testament to how good the rest of the movie is. When I think about my favorite parts of Force Awakens, it mostly revolves around the characters. The new characters, to be specific. JJ Abrams and the cast and crew have hit a home run with this new generation of characters. Poe Dameron (The infinitely likable Oscar Isaac) is great as the confident, and all around ‘good guy’ fighter pilot, even if he is under-served in this entry. Finn (John Boyega) is also a great new perspective on the Star Wars universe as a Stormtrooper desperate to find a new identity and something worth fighting for. Rey (Daisy Ridley) rounds out the new protagonists as the independent, strong scavenger on Jakku, waiting for years now for her family to return for her. Most of my favorite moments are between Finn and Rey, as they get pulled into this hectic, dangerous journey that moves along at a rapid pace. Their charisma and chemistry make them instant stars, and I can’t wait to see where they end up in the new couple of movies. Now, Kylo Ren. Or, Ben Solo as he was named by Han and Leia. Kylo is the most fascinating new character they’ve introduced. Kind of like if Anakin had been done right, Kylo is incredibly powerful, but has a short temper, is incredibly impatient, and tries hard to impress his master: Supreme Leader Snoke. Speaking of Snoke, talk about a crazy introduction. For a minute there, I thought we were going to have a dark Sith Lord that was 30 feet tall. I’m kind of disappointed he’s (likely) not, but I can’t wait to see what he’s all about in the sequels, as well as where Kylo goes from this point. Speaking of which, I guess I’m tiptoeing around THAT huge development. Maybe because I just don’t want to think about it. I didn’t cry the first time I saw Solo die, but it really hit me the second time. If Kylo Ren’s path is leading to redemption, I don’t know if I could ever forgive his character for not only killing Han Solo, a favorite character of mine for decades, but for his own father! If he’s trying to prove himself as a worthy villain for this new series, he’s done it with flying colors. Alright, I’m gonna wrap this up. I could talk about this movie for another 10 paragraphs or more but I wanted to get this done and out there. Overall, I had a blast watching this movie, and it feels good to have great new Star Wars movies ahead of us again. 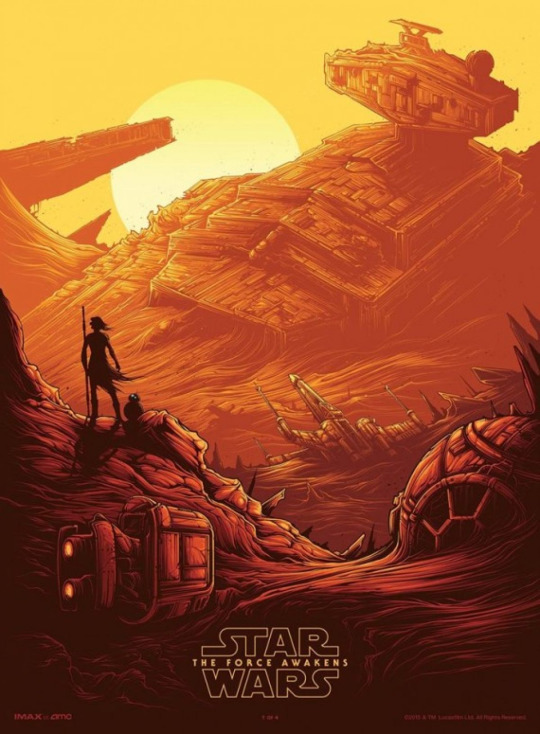 I think The Force Awakens plays it relatively safe, opting more for giving people that nostalgic Star Wars fix they’ve been waiting for since Return of the Jedi, and from here on out it’ll (hopefully) be weirder and unique. With the incredible Rian Johnson writing and directing Episode VIII, my bet is we’re in for something special. I wanted to get this out asap, as I recently saw Hateful 8 and have the Top 8 for 2015 to write up as well, so check back for those, and thanks for reading!